This is a hefty two-volume work, weighing in at over 14 lbs in imperial measures. I had the 16th edition on a disk, having reviewed it for ENT & Audiology News, and that was somewhat easier for the train. The first book, by the man who brought us that marvellous swivel knife, long lost from our local operating theatre, debuted in 1908. Since it last appeared (2003), extensive revision has seen 15 new chapters added (or so the website tells us; the book cover says 20, and it certainly looks much updated, whatever). Increased attention to molecular medicine and technological advances is stressed in the introduction, and, throughout, the basic sciences are notably a major feature. That can be hard work, but, again, as the introduction tells us, we must ‘Be ready for it!’. Further, the book’s coverage is said to be anticipating advances that will appear in the next edition! I think that claim is well made. The immediate impression is of a book that is packed with content and illustrations. The text is set out in three columns, simply filling each page, which does allow a great deal of information, but does create some challenges to the optics of the reader. Colour diagrams abound, but, to start with, I was disappointed to see histological stained sections in monochrome; later on that was transformed. The emphasis is more on the basic, indeed the highly advanced science, of our specialty, although clinical issues are not ignored. Surgical procedures are covered superficially, although again this very much varied with individual chapters. The book opens with the basic sciences of the ear, which can be a daunting prospect. Topics on anatomy and embryology one expects. The molecular biology of hearing and balance is something new however, supported by 171 references, naturally all well updated for such a topic. The chapter on physiology of the ear merits some superb colour diagrams, and even I can forgive a scanning electron microscope image in black and white! I wish I could reproduce a diagram from the magnetoencephalography chapter, which involves super-conducting quantum interference devices (‘SQUIDS’) mapping the auditory cortex of an unfortunate soul in recline. By this stage, I was already impressed. Now we had 336 references and probably the most readable account I have seen for some time, of what can be baffling. Chapters on gene therapy and inner-ear drug delivery were bound to be short, as representing ‘cutting edge’ topics, but again showed the topicality of the book. After ‘Hair Cell Regeneration’, ‘Cochlear Biophysics’ and ‘Central Auditory Processing and Functional Neuroimaging’, I was still only at page 118, but these titles do convey the approach throughout. Some clinical chapters on hearing aids and vestibular evaluation followed, but still with that emphasis on the underlying science of it all. ‘Imaging of the Temporal Bone’ was a massive chapter, with scans reproduced to very high resolution by the printers. I would have wished for some of the normal anatomy pictures to be larger (e.g. Figures 11–5 and 11–6), for those less familiar with them. Professor Nadol’s chapter on pathology in otology and neurotology was all one would expect from him, and now I had those stained histological sections in glorious colour! Chapter 13 is on research methodology, with a generic text well beyond otology. Those who cannot tell a cohort study from a case control series (and I still get confused) should read this. This one remains my favourite chapter. Some minor disappointments were inevitable. Sudden deafness, covered in only four pages, probably tells us more about how little we know, than of any failing of the authors. Of 75 references, no fewer than 50 pre-dated the millennium, the more recent solely referring to steroid therapy. The chapter on facial paralysis management did show some superb results, most notably of VII–XIIth cranial nerve anastomosis. Well, the result at rest is great, but somehow the joke in the pre-operative picture was more effective than the post-operative version, even on the unoperated side! We have all done it. How nice to see such coverage of stereotactic radiosurgery in the neurotology section, which traditionally is surgically aggressive. Up to page 503, I was on safe ground, but now I was delving into rhinology. Again, basic sciences were stressed, including olfaction and gustation, the immune system, and studies of nasal function. Imaging was printed in larger format, which helped a novice. Endoscopic sinus surgery allows far better operative imaging than otologists can manage, clearly, most notably in Chapters 52 and 53. I always did dread the need to poke scissors into someone’s eye in an emergency, a lateral canthotomy, although admitting it seems there is nothing to it. Curiously, I could find no coverage of emergency decompression of an iatrogenic ‘haematoma’. The penny dropped of course and I returned to the index for ‘hematoma’. Yes, ‘Hematoma due to endoscopic sinus surgery’, on page 898. Funnily enough, that took me to otoplasty. I only tell this tale to prove I really have read this book! The second volume is much more clinical. Fascioplastics of course takes us through the cosmetic stuff, but then onto scar revision, flaps and reconstructions. Otoplasty I did look forward to as a personal favourite operation, back in the days when our National Health Service (NHS) allowed us to do such work. Oddly, illustrations of incisionless otoplasty were far more prominent than those of traditional techniques. The latter were fine, for one used to such surgery, but are little use to a novice. There is then a very updated section on paediatrics and otorhinolaryngology, even if, oddly, Chapter 69 has somehow sneaked in to cover anatomy and physiology of the oral cavity, oropharynx and salivary glands, very much in adults. There are some great, if scary, images of airway foreign bodies, and it is nice to see the double ring appearance of the lithium battery so well shown. Again, there are some very challenging vascular tumours and malformations, as one might expect. Laryngology included coverage of sleep-disordered breathing and surgery thereof. Figures 98–8 and 98–9 suggest I have been doing it all wrong, and I am now keen to ‘have a go’, even if the same NHS restrictions now apply. Finally, ‘Head and Neck Surgery’ obviously illustrates the massive expansion in understanding of molecular biology, with text that again is ‘leading edge’ material. ‘Navigational Systems and Robotic Surgery’ is a ‘must’ for any clinician’s reading. This book is remarkable value and Amazon suggests an even better bargain to be had. This must be the ultimate reference book for the departmental library. It is more one to dip into than to read cover to cover. For our UK exit examination, the multiple choice questions can make such reading essential. I somehow doubt that face-to-face vivas could get to this level, knowing the examiners as I do. This stands up well to the obvious competition. Our own Scott-Brown’s Otorhinolaryngology is aging in its seventh edition (2008), with the Amazon promise of the next edition in 2018 (one hesitates publicly to cast any doubts, but…). 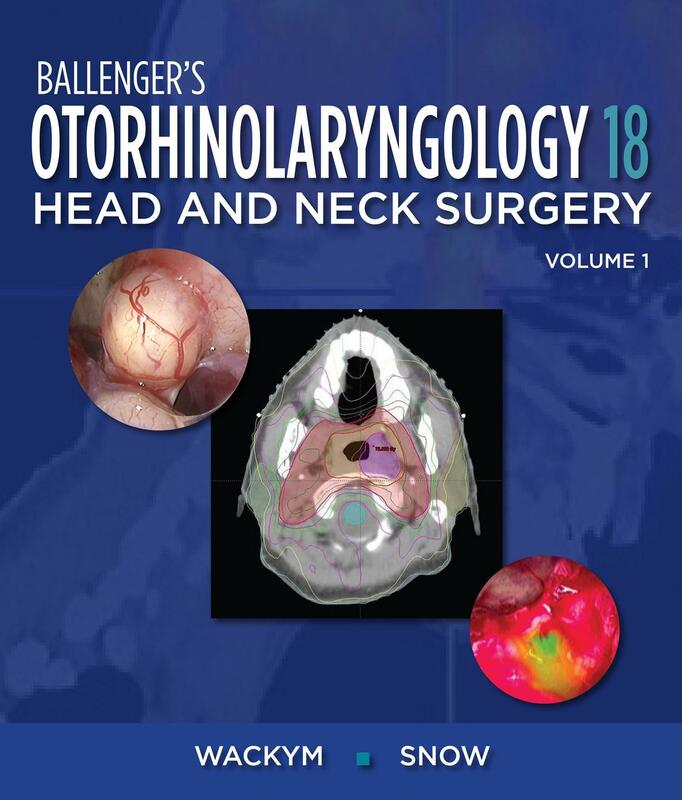 The Cummings Otolaryngology sixth edition dates back to 2010 and is far more expensive.